You can use the Auto Color Correction Options dialog box to tweak exactly how Photoshop CS6 applies its Auto Tone, Auto Color, and Auto Contrast controls, as well as for the manually operated Levels and Curves commands. You can apply the settings only to a particular image-editing session or save the settings as defaults for all your Photoshop work. Open an image and choose Image→Adjustments→Levels or press Ctrl+L (Command+L on the Mac). You can also use the Curves command by pressing Ctrl+M (Command+M on the Mac). Click the Options button in the dialog box to access the Auto Color Correction Options dialog box. In the Algorithms area, click the method you want Photoshop to use to adjust the tones. Enhance Monochromatic Contrast: This option applies the same changes to the Red, Green, and Blue channels, making brighter areas appear lighter and shadow areas appear darker, with no changes made to the colors. 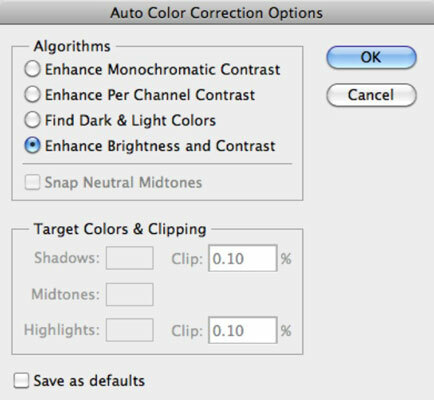 Enhance Per Channel Contrast: This option individually adjusts the red, green, and blue colors so that each has its own best balance of light and dark tones, even if the color balance changes a bit. Find Dark & Light Colors: This option locates the average lightest and darkest pixels, and uses their values to maximize the contrast of the image. Enhance Brightness and Contrast: This newest algorithm analyzes the pixels in your image and does a content-aware monochromatic enhancement. This option seems to do a better job of adjusting without introducing new issues of color casts or gaps in your histogram, so don’t be too quick to change from this new default. Create a couple duplicates of your image and try a couple different settings first. Select the Snap Neutral Midtones check box if you want Photoshop to base its gamma, or midtone, correction values around a neutral color located in the image. In the Target Colors & Clipping area, enter a value in each of the Clip text boxes. Setting clipping values between 0.5% and 1% eliminates the too-dark and too-light pixels. These values adjust the percentage of black and white pixels that Photoshop removes from the darkest and lightest areas of the image. This option is useful because every image includes some very dark pixels that contain no real image information, as well as some very light pixels that are completely washed out. Factoring in these two kinds of pixels when you adjust tonal values is a waste. By setting the clipping values between 0.5% and 1%, you leave these no-good pixels out of the picture. Click the Shadows, Midtones, or Highlights swatch. The Color Picker appears, allowing you to set a preferred value for the darkest, medium, and lightest areas. Select the Eyedropper tool from the Tools panel. Move your mouse over the image and locate the dark, middle, or light tone you want to use. Click it when you find it. Click OK to exit the Color Picker. Repeat Steps 6 through 8 for each of the three colors you want to change. When you move the mouse over the image, the values in the Info panel change, helping you pick the shadow, midtone, or highlight area you want. Back in the Auto Color Corrections Options dialog box, select the Save as Defaults check box to store the settings you just made for subsequent use in any Photoshop session. If you don’t select the check box, Photoshop applies the changes you made to only the current session. Click OK to exit the Auto Color Correction Options dialog box. Your options are now customized. Note that these changes also affect the Auto buttons in the Levels and Curve dialog boxes.